Experience is an asset at all levels of sport, and no one is more aware of this than the SF State women’s volleyball team. Seasoned players have been scarce in recent years but for the first time in a long time, the Gators have a core of veteran leadership to guide them. 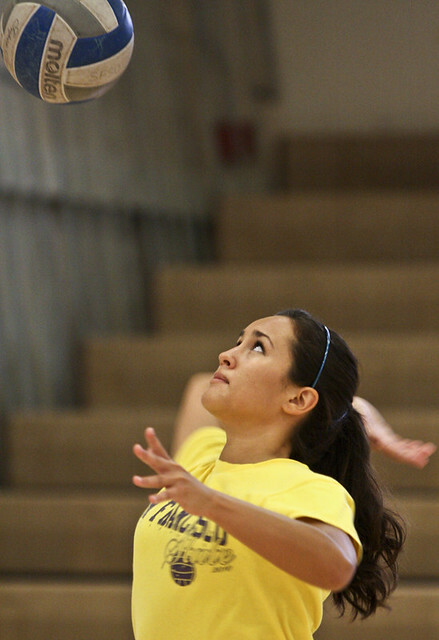 SF State senior Sarah Kurfess, serves the ball during volleyball practice on Aug. 19, 2011. Photo by Erik Verduzco. Four years ago, coach Michelle Patton was entrusted with reviving a program that had been dormant for years. Today, the dust has long been shaken from the nets. With a nucleus of returning players, the Gators have their focus on competing for a California Collegiate Athletic Association title. Senior middle hitter Halimah Oswald was a member of Patton’s first team at SF State and understands the value of consistency. “The first year, we had just three girls come back and everyone else was new, so it’s really exciting having a good core group come back,” Oswald said. The team’s lynchpin is junior setter Iris Tolenada. In 2010, Tolenada earned first team All-CCAA honors by leading the conference in assists while also being at the top of her team in digs, 276, and service aces, 36. Tolenada, who set the SF State single-season assist record as a freshman, is the pivot point for the Gator offense. Her 1,186 assists accounted for 88 percent of the team’s cumulative total in 2010. Patton, who played setter at the University of Washington, expects a lot from players in that position. Tolenada has flourished under Patton’s guidance. “(Patton) is really on the setters, so it makes me want to push myself harder,” said Tolenada. The team also features four seniors, including Oswald and defensive specialist Sarah Kurfess. Both were named second team All-CCAA in 2010. Also returning is junior Lauren Walsh, who led last year’s team in kills (344). The newfound continuity in the program has made SF State a more attractive destination for new recruits. The veterans are joined by a quality group of newcomers who will push returning players and challenge them for playing time. “We have a lot more new talent this year so we’re all excited to just get into a match and play,” Tolenada said. Improvement has been steady since the women’s volleyball program was revived in 2008. The 2009 and 2010 campaigns marked the team’s first back-to-back winning seasons since 1988. Though the team finished 2010 just above .500, the team showed at times that it could compete at an elite level. The Gators defeated nationally ranked UC San Diego for the second year in a row and took eventual NCAA tournament quarterfinalist Cal State San Bernardino to a decisive fifth set. Patton believes the key to success in 2011 will be maintaining a high level of play throughout the season. “The maturity and the mental toughness that it takes to play in those matches and win those matches, not just in the beginning of the season but in the end of the season as well, it is going to take … being up for the challenge every time we step into a match situation,” Patton said. For a program that is a mere four years removed from a long hiatus, the team has lofty goals for the upcoming season. Correction: This story is an updated version of the original post to correct Iris Tolenada’s number of digs during the 2010 season from 550 to 276. SF State Theatre Arts Department breathes new life into "The Barber of Seville"